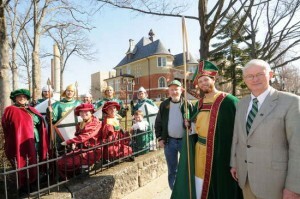 The tradition continues … Colin Bodeman is St. Pat 2009. Here, Bodeman is pictured with Chancellor Carney, Dr. Lance Haynes and the 2009 court. … Hopefully the weather will continue to cooperate.